BBC World Service - The Forum, Symbols, Signs and Secrets. What symbols tell us about ourselves. Exploring the importance of symbols, how their history relates to us today and how we might use them in the future. Art Historian Dr Janina Ramirez explores symbols in our past and present- how we use them in our everyday lives, their place in distant history and how they are evolving. Ranging from hieroglyphics in the ancient World through symbols in art to the increasing use of the emoji, Dr Ramirez examines the power of the symbol and its importance. With her to discuss symbols and signs, Professor Martin Kemp, Emeritus Research Professor of the History of Art at Oxford University whose special interest is Leonardo Da Vinci, Professor Mimi Ito, a cultural anthropologist who studies new media use, particularly among young people in Japan and the US, from the University of California, Irvine and Professor Joann Fletcher, an Egyptologist and honorary visiting Professor at the University of York in the UK who explores the link between ancient symbols and how we communicate today. 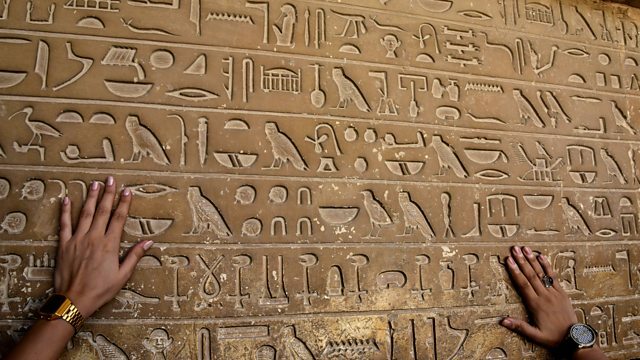 Photo: Hieroglyphics from the Giza Pyramids in Cairo (Getty Images). Toilets of the World Unite? Martin Kemp is Emeritus Research Professor in the History of Art at Oxford University. He has written and broadcast extensively on imagery in art and science from the Renaissance to the present day. He speaks on issues of visualisation and lateral thinking to a wide range of audiences. He has curated a series of exhibitions on Leonardo da Vinci and many other themes. In the programme, Martin explores symbols in art and what they meant when they were painted. Joann Fletcher is an Egyptologist and Honorary Visiting Professor in the Department of Archaeology at the University of York in the UK. Her main interests centre around body adornment throughout the ancient world, long-term research into the use of wigs, perfumes, cosmetics, tattoos and amulets by the living and the dead led to a fascination with mummification and burial practices. In the programme, Jo explores the meaning of ancient symbols and what they tell us about the past and the present. Mimi Ito is a cultural anthropologist who studies new media use, particularly among young people in Japan and the US. She is Professor in Residence and John D. and Catherine T. MacArthur Foundation Chair in Digital Media and Learning at the University of California, Irvine. She has led a three-year collaborative ethnographic study, funded by the MacArthur Foundation, examining youth new media practices in the US, and focusing on gaming, digital media production, and Internet use. Mimi is interested in how we use symbols today and how this might evolve.